Are you getting your slice of snacking cheese sales? From the highly versatile soft white cheese, to 'on the go' cheese snacks, spreads for sandwiches and cheese slices for burgers, there is a snacking cheese product to meet all your shopper's needs so it’s a category worth getting right. The snacking cheese segment equates to 18.4%1 of total cheese and is growing at 1.5%2. Mondelez International has a 41% share of this segment with the number one brand, Dairylea3. The cream cheese subcategory is worth £125m4 and Philadelphia is the UK’s number one soft white cheese brand5. Where is the snacking cheese opportunity? 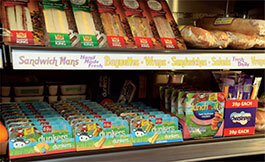 Maximise impulse sales and meet the food to go shopper mission by locating single eat cheese snacking lines (Kids Snacks, Lunch Combinations) in a separate on-the-go chiller with sandwiches and drinks.